Hey guys what are some good resources about Hussite weapons and armor? I can suggest a view visual sources... I think most modern illustrations of Hussites are essentially based on just a few original depictions. This large battle scene is probably the best known depiction of a Hussite wagenburg. It appears in many books on the Hussites, and high resolution images are now available online. It's on folio 147-148. There are two similar illustrations of Jan Zizka leading his troops, in the Jena Codex, and a manuscript in Gottingen. Many of the same visual elements appear in a number of carved stove tiles. There is an interesting caricature of a "Taborite brother"... Note that he carries a goose tucked into his belt; the goose seems to be used as a (possibly pejorative) visual identifier for the Hussites and was probably not used on their banners as appears in the first illustration (and others). The term "Hussite" was not used at the Council of Basel in 1431, at the request of the Bohemian delegates. A few more battle scenes include similar details of flails, pavise shields, etc. and are thought to depict or be inspired by the Hussites. Extending the time period a little bit, Czechs appear in early 16th century German illustrations using what would by then be old-fashioned equipment, in particular pavises and ahlspiess spears distinguish them from contemporary Germans. This last image comes from a series by Albrecht Durer illustrating trophies taken from nations defeated by the Emperor Maximilian. To represent the arms of the Bohemians, he chose to depict an ahlspiess, longsword, and gun, as well as a a pavise and sallet. Thanks Mark some interesting ones in there I had not seen before. Any historical of the giant pavises in the second drawing? They appear in Bellifortis, a manual of military technology. There are a number of surviving copies with roughly equivalent illustrations; the first illustration of the wagenburg is taken from one of these copies, though this is not part of the standard series of illustrations. There seem to be two types of large shield described... one usually seems to be a conventional siege mantlet, perhaps the other that looks like a giant horseman's targe, complete with lance cutout, is more speculative? The Bellifortis includes many fantastical war machines and astrology alongside the more realistic elements. Here is another illustration of the Battle of Schönberg (or Wenzenbach), shown in the woodcut above. Maximilian defeated Bohemian mercenaries in 1504 as part of the Landshut War of Succession. The Bohemians are still shown with the Hussite chalice symbol on their pavises. Alhspiess are not emphasized as much, though a couple are still included. Many of the Bohemians are shown using curved messer-type swords, tesaks/dussacks as they would be called in Czech. These seem to appear in several of the stove tiles as well. It seems that the Bohemian nobility tended to have the same range of styles as the Germans and others in the immediate area. The tended to wear longer surcoats and longer sleeves. The armor and styles tended to change a bit slower and I think tended to be a bit old fashioned. That is it seems the French and English tended to take on new styles of armor etc a bit faster. Or that is at least the clear impression you get from all of the effigies, paintings and miniatures etc. So my idea is if you were going to going to do a Bohemian nobility fighting for the Hussites you would look pretty much like a German and other area knights of the same period and area. Also even the other Hussites would I believe have been incorporating at least the armor etc as they captured it. Men at arms and converted, merchants and peasants etc would vary in great degree in the equipment they had. And there seems to have been a lot of cross over in what was used by whom and when. For example mounted fighters fighting both in and around the wagons but then also on horse back as needed. Of course many would look like the typical lightly armored typical flail using type we tend to think of when we think of Hussites. With this in mind and looking at the examples I mentioned it fits in well with what I had thought of doing before (German Knight). Surcoat is going to be long probably about knee length with long probably split sleeves. I will use a front only breastplate over the surcoat and a mail skirt on the front like is shown in much of the art from the time. I will use both a kettle helmet and bascinet. There are a lot of effigies with looks very much like that with some variations. A link or two where you can see the mail skirt and breastplate combo better. There are many more images from different sources but that gives you an idea. Embroidered velvet (but worn) surcoat. Interesting probably 1930s theater costume. Doing some adapting but should work pretty well. And much cheaper than trying to buy a new embroidered, velvet one with lining and other details out of quality material. Also I am wanting the over all look to be warn and distressed. So would feel a bit bad about doing that to something new just commissioned haha. Other odds and ends. And other things that do not match I am selling. Hi Patrick, your ideas all sound pretty good to me! I definitely agree that German styles should be the strongest influence in your gear. A link or two where you can see the mail skirt and breastplate combo better. As a side note many of the effigies and miniatures from the period have bells hanging from the belt at the natural waistline. I have noticed this as well, in Germany mainly, and a few examples from nearby countries... there is one shown in an outdoor statue/facade in the Netherlands, but I forget where. A bandoleer of bells appears in a Danish fresco discussed in that thread, but they are worn by a non-military figure. If you find more examples, I'd be curious to see them! Another approach that could work with the gear you have and differentiate you from the "Central European knight" mold would be to portray an armed burgher/minor noble or town guard of the city of Prague. Prague was large and wealthy, and had a complicated relationship with the more fanatical Hussite brotherhoods - sometimes allied, sometimes opposed. I think this background could justify a combination of the "upper-class" international/German armour, with some specifically local, Bohemian details, like a hand-pavise shield, curved tesak sword, Eastern-style kettle hat... You might be able to find some other local livery/coat of arms/etc. to use - there is a banner of Prague from a little later in the century that includes Hussite emblems for example. I find it interesting that some hussite depictions shows a heavy use of crossbows (wagontrain image and two of the carved tiles shown) whereas other images focus much more on pikes and guns. Dührer picture showing only pikes and the Schönberg battle with hussites wielding both pikes and guns. Is this a perhaps a diachronic development? Early hussite using more crossbows and later hussites handguns. Or more a synchronic difference between defensive and offensive warfare or elite units compared to more regular units? Hey Niels! I think these sources reflect quite well the development of Czech military technology in the 15th century... The Hussites are generally known for being among the earliest adopters of firearms en masse, but crossbows were still used in larger numbers, particularly early in the war before the towns could produce handguns in large numbers. After the end of the Hussite wars, Czechs gave good service as mercenaries throughout Eastern Europe, particularly in the Black Army of King Matthias Corvinus of Hungary. A surviving letter from the king includes a description of his infantry tactics, based on pavisemen, handgunners, and supporting infantry fighting from static positions "similar to a wall" - just as shown in the illustrations of Schönberg. The ahlspiess pike also seems to have likely been adopted mainly in this period. A later reference to the "Czech custom" of fighting with large pavises can also be found in the Zeugbuch of Emperor Maximilian. By this time, the defensive tactics of the Czechs were outdated and could not withstand the increasing use of artillery on the battlefield. At Schönberg, their formation would be decisely broken by German troops led by Georg von Frundsberg, the "Father of Landsknechts". So since the Hussite where isolated politically they had first to build up their own domestic gun production. Since the Czech's have a long tradition of constructing excellent firearms the roots for that tradition was laid during these conflicts with likely a lot of trial and error going on. Not a coincidence that the Czech name pistala (= pipe) became that international word for pistol and houfnice was loaned to english howitzer. Even the later word robot is also from Czech robotnik (forced worker). Also interesting that the tactics of the wagontrain was continued in this kind of static "wall" you describe the Hussite used when as mercenaries. It is quite paradoxical that a tactics pioneering the use of artillery on the battlefield would itself become obsolete by the use of artillery by the enemy. Really a case of turning the gun against its "owner". Something akin to Hussite battle tactics was interestingly "copied" by Oda Nobunaga against Takeda Katsuyori at the Battle of Nagashino in 1575 where combination of stockades and guns showed its devastating effect on an unsuspecting enemy army focusing on cavalry charges. Oda Nobunaga even used volley fire. Is it known whether the hussites used volley fire as well? Also interesting that the tactics of the wagontrain was continued in this kind of static "wall" you describe the Hussite used when as mercenaries. It is quite paradoxical that a tactics pioneering the use of artillery on the battlefield would itself become obsolete by the use of artillery by the enemy. Yes, it is a very interesting bit of history... Corvinus describes the infantry holding in defensive positions behind the pavise wall, until "the given moment to break out of it" and counterattack, but I do not know of any more detailed description that describes exactly how the handgunners deployed. Here is an early depiction of an ahlspiess, attributed to an unnamed Bohemian master circa. 1400-25, from a series of illustrations for the "Travels of John Mandeville" in the British Library. There are a few ordinances the Hussites had with percentages of soldiers to each other. I posted it here before but cannot find it. I'll see if I can find them today and edit this post to include it. Hi Randall, I'd be very curious to see that... hope you can find the references! Thats an interesting idea and one I am going to have to do some more research on. Also where are the images from. I think I have seen the drawing but cant remember where. That would be very interesting if you can find it. Here it is- from sometime in the run of the Hussite campaigns. The Hodetin ordinance states 2 drivers, two hanggunners, 6 crossbowmen, 14 flailmen, 4 halberdiers, two pavisiers. Thanks Randall! I thought I had heard the ratio of bows to guns was 3 to 1 at some point... this must be the source. They're from Ian Heath's Armies of the Middle Ages. Illustrations of a Prague town guard, Hussite horseman, and Polish retainer. So a question. Are these images showing only vambrace or is the rest of the arm armor missing in the museum piece as I assume the spalders are and the effigie just just seems to be only vambraces. 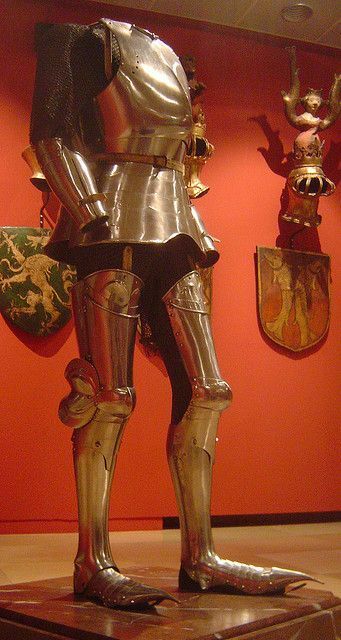 I had never really thought about it until I looked at the armor in the museum in the thread that was linked. Or maybe like the other image where any upper arm protection is part of the spalders?